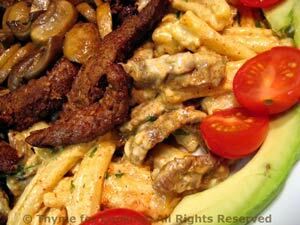 Beef Steak Caesar Pasta Salad, from Thyme for Cooking. With the chili powder, Worcestershire and garlic, this has a surprising kick to it... not hot, just assertive. The creamy Greek yogurt is the perfect foil. When done, drain, put into a large serving bowl and toss with 1 tbs olive oil. Mix chili powder, 2 tbs Worcestershire and garlic. Slice flank steak into strips and toss with chili powder mixture. Clean mushrooms and thickly slice. Heat 2 tsp oil and 1 tbs Worcestershire in large nonstick skillet over medium heat. Add mushrooms and stir to coat. Fry until soft and starting to brown, 5 - 7 minutes. Add remaining 2 tsp oil to skillet. Add beef and quickly stir-fry over medium-high heat, 2 - 3 minutes. Add half the steak to the pasta. After mixing, taste and add rest of dressing if you like. Put pasta in a large bowl. Spread the remaining steak in a circle on top. Add the mushrooms in the center. Arrange avocado slices around the edge. Add tomatoes and serve, any remaining dressing on the side. Mince garlic and put in small bowl. Add mustard, lemon, Worcestershire, vinegar and yogurt (and anchovies, if using) and mix well with wire whisk. Slowly drizzle in olive oil whisking constantly. Whisk in Parmesan and chives.